Town council will be re-examining the federal government’s elimination of a one-third tax exemption for elected officials and its subsequent salary implications, but it won’t be an open discussion in full view of the public. Under previous federal tax law, such an allowance amounting to more than one third of the official’s salary plus allowances qualified for a federal exemption. Introduced in 1946, the exemption was extended to municipally-elected officials in 1953. Federal legislation (Bill C-44) passed in 2017 eliminates this tax exemption effective Jan. 1, 2019, and has resulted in “substantive changes to after tax compensation” for elected officials. The decision has been left up to each individual municipality if or how they might act to counteract the effects of the change. Bill C-44 was justified on the basis that the exemption “provides an advantage that other Canadians do not enjoy.” While reimbursements for specific expenses accompanied by receipts are not taxable the federal government took the view that a special allowance that does not require receipt accounting substitutes for salary is therefore a taxable benefit. Following initial discussion on Dec. 17, town council had voted 6-1 to take no action and accept the change in one third federal tax exemption for information. Coun. Jack Brewin had opposed the motion. While this would have appeared to be an end to the matter, some members of council had other ideas as the issue would resurface for council discussion at the Jan. 14 regular meeting. According to documentation from the Federation of Canadian Municipalities (FCM), without enhanced compensation at the municipal level the tax changes will significantly reduce an elected official’s after tax compensation. While FCM acknowledged that taking no action effectively decreases take-home compensation for affected officials, it also eliminates the need for a municipality to find cost savings or contemplate property tax increases. In responding to the change, some communities have decided that an overall increase in total remuneration for elected officials is necessary to fully or partially replace lost compensation. In a back and forth conversation, Coun. Joe Strojwas immediately questioned the request which had originated with Mayor Andrew Prokop. “I have, through some actual asks,” said Prokop. “Can you explain to us why you want to bring this back?” questioned Strojwas. “Just through the ask of other council members,” replied Prokop. Strojwas continued to press Prokop for answers. “And no reason why?” asked Strojwas. Prokop would yield more information, but focused on the procedural problems involved with bringing the motion back rather than an explanation of why the item was to be reassessed. Coun. Garth Bekkering would weigh in on the procedural aspects of the decision, but also pressed for the “subject at hand” to be discussed at another time. Following discussion on Jan. 14, council voted 6-1 to “address the federal tax exemption for elected officials at this meeting with a two-thirds majority vote.” Strojwas opposed the motion. It would be subsequently discovered that this motion, put forward by Coun. Bekkering, had deviated significantly from administration’s recommended motion which had called for the discussion to be held at a subsequent meeting in closed session. 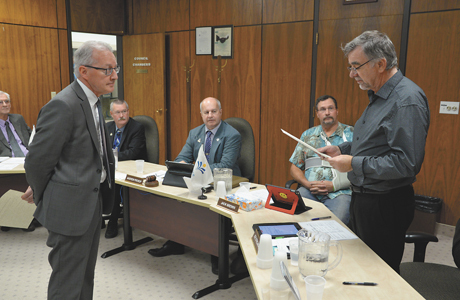 The item was not dealt with on the agenda of the day as suggested by Bekkering’s motion, and administration was forced to seek further direction for clarity at council’s Jan. 28 regular meeting. “It was actually impossible to carry through with due to the agenda already being adopted for that meeting,” said Armfelt on Jan. 28. Although recognizing the need to rescind the Jan. 14 motion and replace it with wording more closely aligned with administration’s recommendations, Coun. Garth Bekkering stated he did not believe the motion he put forward had lacked the required clarity. Following this discussion, council voted 4-1 to bring back the matter of a one third federal tax exemption for council remuneration for closed session discussion at a subsequent council meeting. Councillors Carly Firth and Mark Garner were absent from the meeting, while Strojwas voted in opposition. Debated in open session at the M.D. of Taber’s Dec. 11 regular meeting, that council passed a 4-3 resolution to take no action with regard to the compensation afforded its elected officials. In March 2017, previous council approved a salary increase for the mayor’s position and that of councillors. Starting with the present 2017-2021 council mandate, the mayor’s compensation saw a 39 per cent increase to $42,817, while councillors received a 32 per cent raise to bring the councillor average to $24,765.